Plans for a "box village" built out of shipping containers in Swansea have been unveiled. 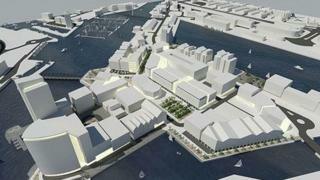 The scheme would form part of the £300m University of Wales Trinity Saint David development on the SA1 waterfront. It would provide affordable space for start-up firms and have links with the university's academic programme. Through that, students, academics and businesses would be brought together to share expertise and explore new ideas for growth. Once a business has outgrown the space provided in the box village, it can then be accommodated in an "innovation precinct" with academic support of the university's business and management department. Prof Medwin Hughes, the university's vice-chancellor, said the box village and the innovation precinct would help to grow new businesses, develop the skills of current ones and attract new investment into the region. "Through such activities the university will create new opportunities for employment, helping to generate more footfall and spending in the city centre and to retain some of the brightest entrepreneurial talents," he added. A phased 215,000 sq ft (20,000 sq m) development would consist of a series of hubs with a focus on the university's academic programme. The aim is to create opportunities for the development of new businesses, products and services. Swansea council leader Rob Stewart said the box village would allow entrepreneurs to "flourish and expand". He added: "Once the components of a box village are in place, they really can look particularly striking and impressive. "This project would complement our plans to develop a digital district on Kingsway and a digital square at the St David's development site which would include digital artworks and digital projections."